A catchment is an area where water is collected by the natural landscape. 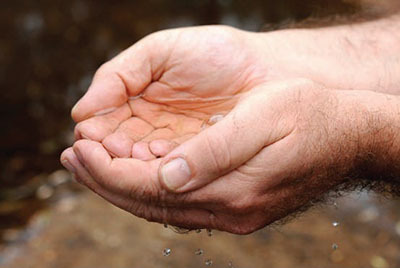 Imagine cupping your hands in a downpour of rain and collecting water in them. Your hands have become a catchment. The outside edge of a catchment is always the highest point. Gravity causes all rain and run-off in the catchment to run downhill where it naturally collects in creeks, rivers, lakes or oceans. Rain falling outside the edge of one catchment is falling on a different catchment, and will flow into other creeks and rivers. Some water also seeps below ground where it is stored in the soil or in the space between rocks. This is called groundwater. Mountains to south of Braidwood on the Southern Highlands. We use the water collected by the natural landscape to help supply water for our needs, by building dams and weirs, or tapping into groundwater. This is called the water supply system. Sydney's water supply system includes 11 major dams that store water collected from rainfall in five catchments: Warragamba, Shoalhaven, Upper Nepean, Woronora and Blue Mountains. 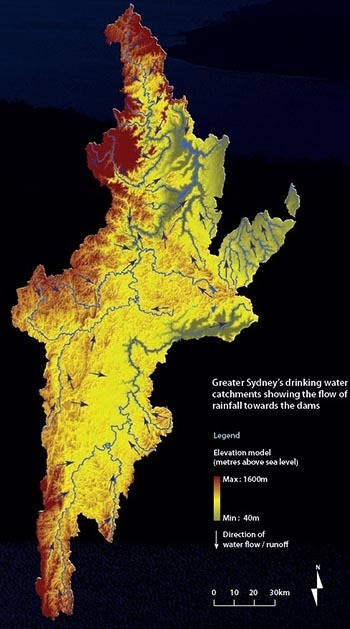 Rain in Sydney does not mean an increase in dam levels if the rain doesn't fall in the drinking water catchments. 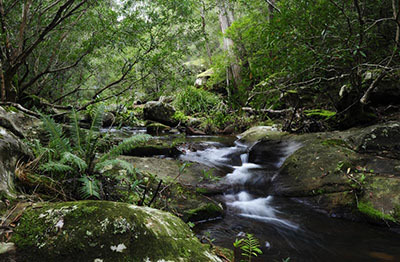 Greater Sydney's water catchments stretch from north of Lithgow at the head of the Coxs River in the Blue Mountains, to the source of the Shoalhaven River south of Braidwood - and from Woronora in the east to the source of the Wollondilly River west of Crookwell. The five catchments cover 16,000 square kilometres of land. This is only 2% of the land area of NSW, but it supplies drinking water to 60% of the state's population - over 4.5 million people who live in Sydney and the Blue Mountains, Illawarra, Southern Highlands, Goulburn and Shoalhaven regions. Human activities affect the health of our water catchments. WaterNSW manages and protects the drinking water catchments of the Greater Sydney region, and supplies high quality raw water. WaterNSW works together with local councils, landholders, government agencies and industry so that daily activities in the catchment - particularly building, industry and farming - do not harm the environment that our drinking water comes from.